The use of just two types of building blocks, linear and angular, in conjunction with symmetry considerations allows the rational design of a wide range of metallocyclic polygons and polyhedra via the coordination motif. The speaker and his research group have used this approach to self-assemble a variety of 2D supramolecular polygons such as triangles, rectangles, squares, hexagons, etc. as well as a number of 3D supramolecular polyhedra: truncated tetrahedra, trigonal prisms, cuboctahedra and dodecahedra. An example of the methodology is illustrated in Figure 1. More recently they have functionalized these rigid supramolecular scaffolds with different electroactive, host-guest, dendritic (Figure 2), and hydrophobic/hydrophilic moieties and have investigated the properties of these multifunctionalized supramolecular species. Additionally, they have begun to explore the self-assembly of 2D polygons and 3D polyhedra on a variety of surfaces with the aim of developing their potential to be used in device settings. These novel, supramolecular ensembles are characterized by physical and spectral means. The design strategy, formation, characterization and potential uses of these novel metallocyclic assemblies will be discussed, along with the speaker and his research group's very recent results. Figure 1. Self-assembly of a nanoscale dodecahedron. Figure 2. 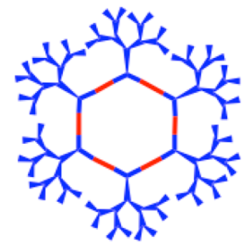 A cavity-cored dendritic hexagon. Prof. Peter J. Stang received his PhD in Chemistry in 1966 from the University of California, Berkeley. After his postdoctoral fellowship at Princeton University, he joined the faculty of The University of Utah as an Assistant Professor in 1969. He is currently Distinguished Professor of Chemistry and he holds the David P. Gardner Presidential Chair. The primary focus of Prof. Stang’s current research is molecular architecture and supramolecular chemistry via self-assembly. The motif used to construct supramolecular species is coordination and chelation to form discrete molecular entities with well-defined geometries and shapes. The ultimate goal of this research is the rapid assembly of nanoscale molecular devices for practical applications such as information storage, artificial photosynthetic devices, etc. Prof. Stang has been an editor of the Journal of the American Chemical Society since 2002. He is the recipient of the Priestly Medal of the American Chemical Society (2012) and the US National Medal of Science (2011). He is also a Member of the US National Academy of Sciences, a Fellow of the American Academy of Arts and Sciences, and a Foreign Member of the Chinese Academy of Sciences.